Then, I saw a friend posting up his discount code that we can use if we order from dahmakan and I decided to try it out. 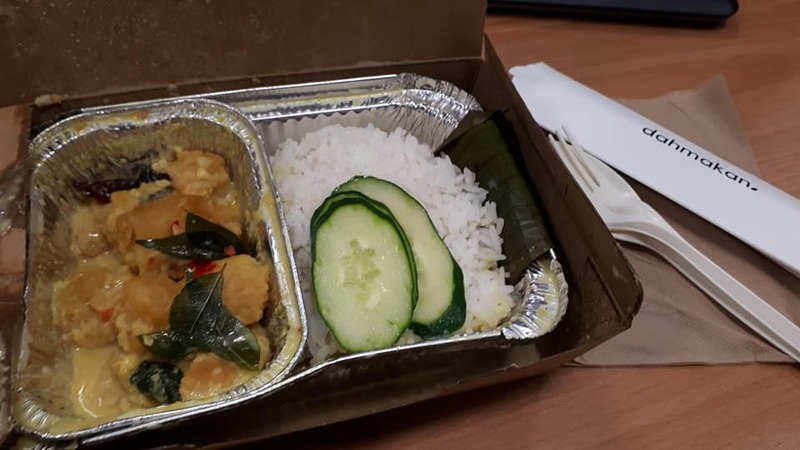 I ordered their buttered chicken, opt it to be delivered the next day between 11.30 am - 12.30 am to my office. My order arrived at 12.28 pm so yeah, within the delivery time (next time, have to choose earlier delivery time la). Quite delicious for RM12.90 (and with the discount voucher, I saved RM12.00) and the portion was surprisingly more than enough for me. My order was below RM18.00 so there was an extra charge, plus delivery charge of RM3, I ended up paying RM6.00 in total. OK la, I didn't mind because I just wanted to try this dahmakan thingy out. RM6.00 for my lunch is very reasonable right? Anyway, first time users can get RM40.00 off if they order with this link. 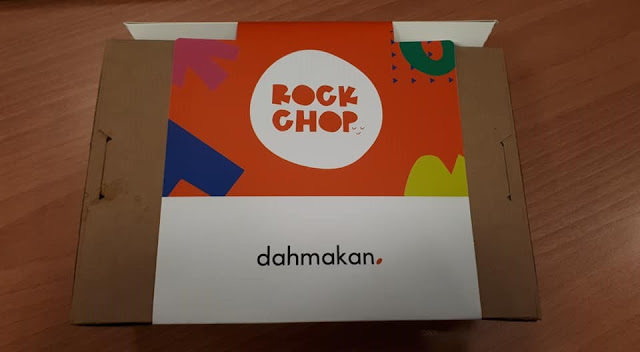 Heard about dahmakan from radio few days ago. My friend ordered from them before. Taste good. I have heard of this and you have confirmed that it is good! So convenient. No need to cook, no need to go out to tapau. Yup, very easy... can just chill on sofa and food arrive to eat! We had another interview session and for December, we sat down with Jamusyahida who is on her way to being fit and fabulous through a healthy lifestlye. Let's read about her journey. Hi, thank you for taking time to answer our questions on your weight loss journey towards a healthier lifestyle. First of all, can you tell us a bit of yourself? I am a 43 years old mother with two teenage kids, 18 and 16 years old. I work as IT support in Cyberjaya. This contributed towards my obese situation with sitting jobs for 8 hours and working shift. Can you share with us how much weight you have lost and how long did it take for you to do it? I started in Aug 2016 weighing 125kg and in Feb 2018 I reached 78kg. It took me about one and half years to shed 47kg and I am currently still working to shed some weight but it has been a really slow progress. What triggered you to make the tremendous effort and commitment? 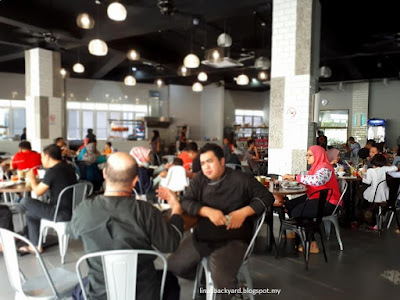 We knew that Dayang Sarawak Corner is opening another outlet in Putrajaya as we used the road that passes the shop lot where Dayang Sarawak is located everytime we head to PoJ for races in Putarajaya. It was opened earlier this month and we finally made our visit for lunch one weekend after a short race route recce with RAUR race director. RAUR is a 12-hour ultra relay race which will be held on Saturday, May 12th 2018 in Taman Warisan Pertanian, Putrajaya. It was after the route reccee and we actually stopped by Presint 15 to head to the vet there and decided to have lunch at Dayang Sarawak. It was already lunch time so the outlet was already buzzing with diners. Service was fast. We sat down and we were quickly handed the menu. It only took a few minutes for our order to arrive. Saucony Run in coming to Malaysia with its inaugural this September. 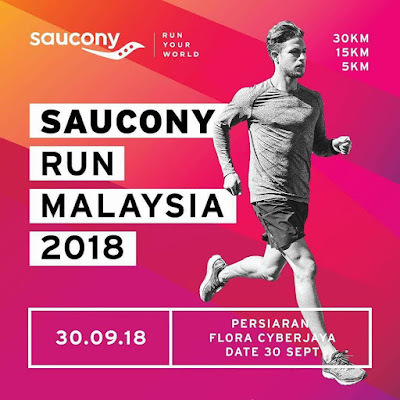 Saucony Run Malaysia 2018 is scheduled to be held on September 30 at Persiaran Flora, Cyberjaya. A city is defined by its people, they are the blood that runs through the veins of a city’s street, and its heart beats to the pace of their drum. Join us as we follow the people who know their cities the best. Experience how they RUN THEIR WORLD, the Saucony way. You can send me e-mails and I might reply you but I like comments better and reply to all of them. So there you go. :) But if you want to contact me for reviews, or announcements or any partnership... you're of course welcome to send me email at lina1975a at gmail dot com. Cheers!